2/2009 – Since May 2008, the township has repaired the roof and installed lighting as well as a new sign indicating the property’s historic nature and construction date. In February 2009, the township received a grant from the New Jersey Historic Trust to conduct a charrette to discuss the building’s future and complete a feasibility study and current conditions assessment on the building. The grant was matched with funds from the township and the Weymouth Historical Society. 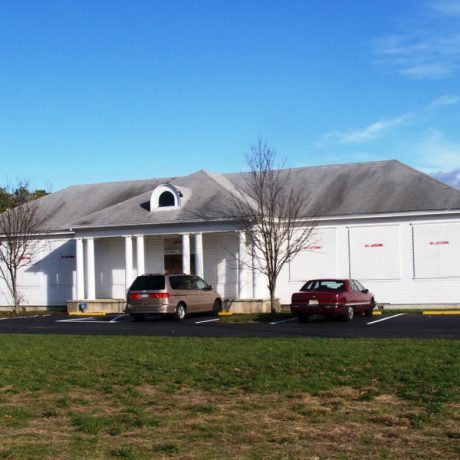 2011 – The municipality has recently declared that it does not plan to proceed with efforts to determine an adaptive use for the Belcoville Post Office. The future of the building remains uncertain. Bethlehem Steel constructed this original post office in 1918 to service its new munitions plant, offices, residences, stores and support buildings for the thousands of workers who populated the new community that was assembled in a matter of weeks during World War I. It is the only surviving post office from the many munitions plants and villages that were created during this era. While the plant closed at the end of the war and the community disassembled, the old post office was not demolished and housed an elementary school until 1990, and later a community center. It was closed to the public in 2000 over structural concerns that have yet to be addressed by the township, which owns the facility. Maintaining classical symmetry, the structure greatly reflects its use as a school, with a projecting columned portico, hipped roof, and large windows for the classrooms. In 2005, the local government explored the feasibility of adaptive use scenarios and associated costs, but there has been no action toward rehabilitation, and talk of demolition continues. The building, meanwhile, remains in stable condition with some termite damage. Restoration and rehabilitation is estimated at $1 million. In 2007, the structure was listed on the New Jersey Register of Historic Places, and in 2008, on the National Register of Historic Places. This registration protects of the structure from alteration or demolition by the owner, which would have to consult with the Historic Preservation Office on proposed building plans. More importantly, registration makes the structure eligible for planning and preservation grants for future restoration and rehabilitation. The building has many aspects working in its favor for long-term preservation. It is a modest structure, utilitarian in nature, and holds a special place in the community because of its years of use for educational and community activities. Moreover, it is an obvious candidate not only for a sensitive rehabilitation for a new use, but could incorporate “green building” materials and methodologies and serve as a responsible example how historic preservation and resource conservation are natural partners in building stewardship. Preservation New Jersey knows that the greenest building is the one that is already built.